From Cambridge to Hayes, Kent is about 70 miles, but travelling even the smallest distance at that time could be fraught with difficulty. Some of the dangers included ill-maintained roads, the risk of robbery or worse by the ever-present highwaymen, and the breaking down of chaises or coaches along the way. Like mentions of health, sending a letter to friends and loved ones to let them know they arrived safely after a journey was a common topic in 18th century correspondence. Another experience of a risky sojourn is mentioned by Pitt in a letter he wrote to his friend Edward Eliot on August 4, 1783. 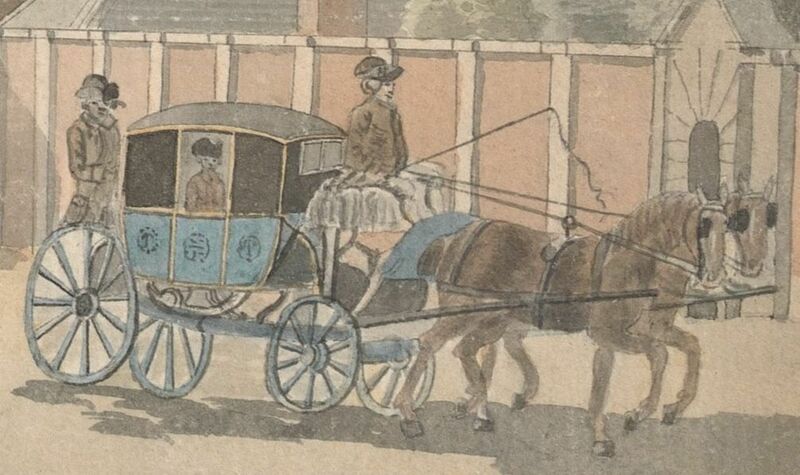 He had been travelling from London to Brighthelmstone [now Brighton] for a holiday and encountered some trouble along the way: "...the Time on the Road, which included the Breaking of my Horses' Knees, and pretty nearly of my own Leg..." . Again, the distance between London and Brighton is about 70 miles. Pitt spent a great deal of time on horseback, so it is a wonder that he escaped any serious injury on the road. 1. William Pitt to George Pretyman, October 7, 1774. Suffolk Record Office. Pretyman MSS: HA 119: 562/659. 3. William Pitt to Edward James Eliot, August 4, 1783. Suffolk Record Office. Pretyman MSS: HA 119: T108/39, f. 243. Figure 1: Detail of a watercolour by Thomas Sandby, c. 1760. Accessed via: http://media-cache-ec0.pinimg.com/originals/27/cb/e7/27cbe79666b0a71041495793a9c474e7.jpg.